Azure DevOps Projects presents a simplified experience where you can bring your existing code and Git repo or choose a sample application to create a continuous integration (CI) and continuous delivery (CD) pipeline to Azure. An Azure subscription. You can get one free through Visual Studio Dev Essentials. Access to a GitHub or external Git repo that contains .NET, Java, PHP, Node, Python, or static web code. 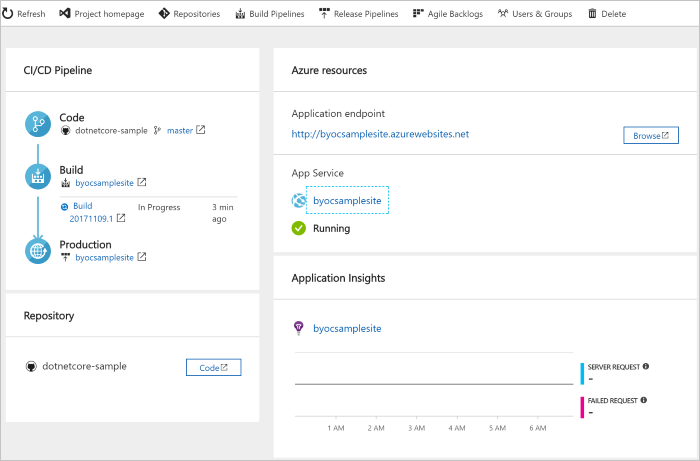 Azure DevOps Projects creates a CI/CD pipeline in Azure Pipelines. You can create a new Azure DevOps organization or use an existing organization. Azure DevOps Projects also creates Azure resources in the Azure subscription of your choice. In the left pane, select New. In the search box, type DevOps Projects, and then select Create. Select Bring your own code, and then select Next. Select either GitHub or an external Git repo, and then select your repo and the branch that contains your application. Select your web framework, and then select Next. The application framework, which you chose previously, dictates the type of Azure service deployment target that's available here. Select the target service, and then select Next. Create a new Azure DevOps organization or select an existing organization. a. Enter a name for your project in Azure DevOps. b. Select your Azure subscription and location, enter a name for your application, and then select Done. After a few minutes, the DevOps Projects dashboard is displayed in the Azure portal. A sample application is set up in a repo in your Azure DevOps organization, a build is executed, and your application is deployed to Azure. 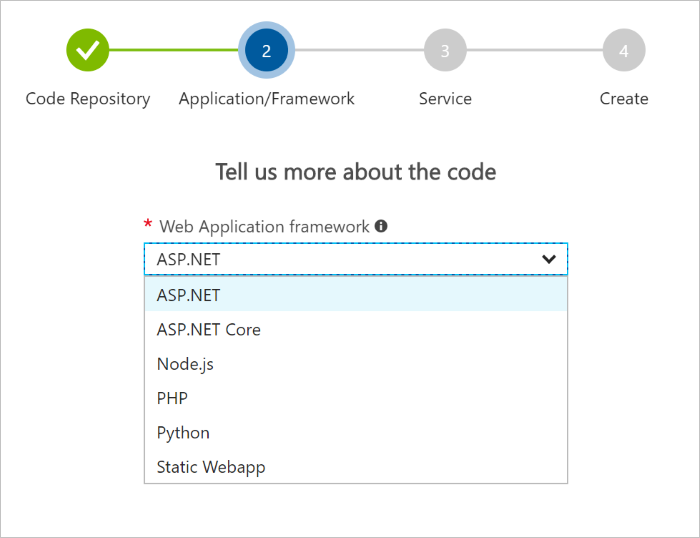 This dashboard provides visibility into your GitHub code repo, the CI/CD pipeline, and your application in Azure. Select Browse to view your running application. Azure DevOps Projects automatically configures a CI build and release trigger. Your code remains in your GitHub repo or another external repo. You're now ready to collaborate with a team on your app by using a CI/CD process that automatically deploys your latest work to your website. Each change to the GitHub repo starts a build in Azure DevOps, and a CD pipeline executes a deployment to Azure. Make a change to your application, and then commit the change to your GitHub repo. After a few moments, a build starts in Azure Pipelines. You can monitor the build status in the DevOps Projects dashboard, or you can monitor it in the browser with your Azure DevOps organization. After the build is completed, refresh your application to verify your changes. At the top of the DevOps Projects dashboard, select Build pipelines. A browser tab displays the build pipeline for your new project. Point to the Status field, and then select the ellipsis (...). A menu displays several options, such as queueing a new build, pausing a build, and editing the build pipeline. In this pane, you can examine the various tasks for your build pipeline. The build performs various tasks, such as fetching sources from the Git repo, restoring dependencies, and publishing outputs used for deployments. At the top of the build pipeline, select the build pipeline name. Change the name of your build pipeline to something more descriptive, select Save & queue, and then select Save. Under your build pipeline name, select History. You see an audit trail of your recent changes for the build. Azure DevOps keeps track of any changes made to the build pipeline, and it allows you to compare versions. Azure DevOps Projects automatically creates a CI trigger, and every commit to the repo starts a new build. Optionally, you can choose to include or exclude branches from the CI process. Depending on your scenario, you can specify policies to keep or remove a certain number of builds. Select Build and Release, and then select Releases. Azure DevOps Projects creates a release pipeline to manage deployments to Azure. Select the ellipsis (...) next to your release pipeline, and then select Edit. The release pipeline contains a pipeline, which defines the release process. The build pipeline you examined in the previous steps produces the output that's used for the artifact. Next to the Drop icon, select Continuous deployment trigger. This release pipeline has an enabled CD trigger, which executes a deployment every time there is a new build artifact available. Optionally, you can disable the trigger so that your deployments require manual execution. At the left, select Tasks. Tasks are the activities that your deployment process executes. In this example, a task was created to deploy to the Azure App service. At the right, select View releases to display a history of releases. Select the ellipsis (...) next to a release, and then select Open. There are several menus to explore, such as a release summary, associated work items, and tests. This view shows code commits that are associated with this deployment. The logs contain useful information about the deployment process. You can view them both during and after deployments. 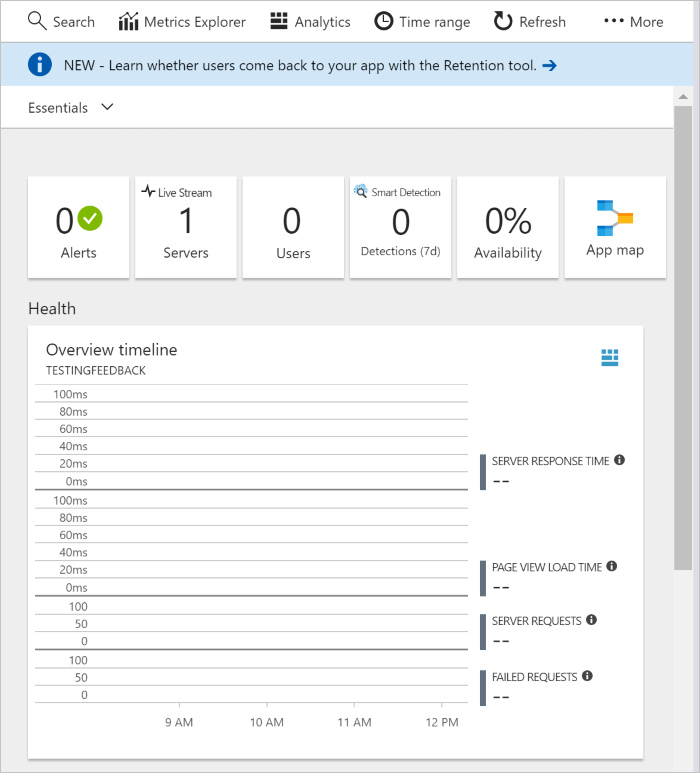 With Azure Application insights, you can easily monitor your application's performance and usage. Azure DevOps Projects automatically configures an Application Insights resource for your application. You can further configure various alerts and monitoring capabilities as needed. In the Azure portal, go to the DevOps Projects dashboard. At the lower right, select the Application Insights link for your app. The Application Insights pane opens. This view contains usage, performance, and availability monitoring information for your app. Select Time range, and then select Last hour. To filter the results, select Update. You can now view all activity from the last 60 minutes. To exit the time range, select x. Select Alerts, and then select Add metric alert. Enter a name for the alert. In the Source Alter on drop-down list, select your App Service resource. In the Metric drop-down list, examine the various alert metrics. The default alert is for a server response time greater than 1 second. You can easily configure a variety of alerts to improve the monitoring capabilities of your app. Select the Notify via Email owners, contributors, and readers check box. Optionally, you can perform additional actions when an alert is displayed by executing an Azure logic app. Select OK to create the alert. After a few moments, the alert appears as active on the dashboard. Exit the Alerts area, and go back to the Application Insights pane. Select Availability, and then select Add test. Enter a test name, and then select Create. A simple ping test is created to verify the availability of your application. After a few minutes, test results are available, and the Application Insights dashboard displays an availability status. When they are no longer needed, you can delete the Azure App service and related resources that you created in this tutorial. To do so, use the Delete functionality on the DevOps Projects dashboard.